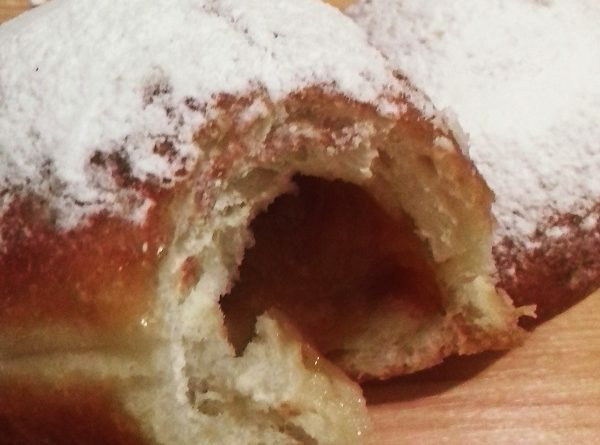 These are perfect yeast jam filled doughnuts so easy to make at home if you have the right recipe. This one is perfect. In a mixing bowl combine 4 cups flour and salt. Mix well. Begin to mix the ingredients into a soft, but not sticky, dough. Add a little extra milk if needed, 1 tablespoon at a time or work in extra flour if needed, 1 tablespoon at a time. Lightly flour a rolling pin then gradually roll out the dough to about 1/2″ thick. Cut out into 3 to 4-inch rounds with a lightly floured cookie cutter. Re-roll the scraps to make more rounds. Place the doughnuts on lightly floured baking sheets, and cover lightly with a dry towel. Let the dought rest, about 20 minutes. Fill a fryer 3-inches high with vegetable oil and heat at about 350 F.
Fry the doughnuts, a few at a time, until golden and puffed, turning frequently, about 5 minutes. Let cool slightly and fill a pastry bag, fitted with a 1/2″ round tip, with jam.